Trust Defender to make thieves and vandals think twice about approaching your property. 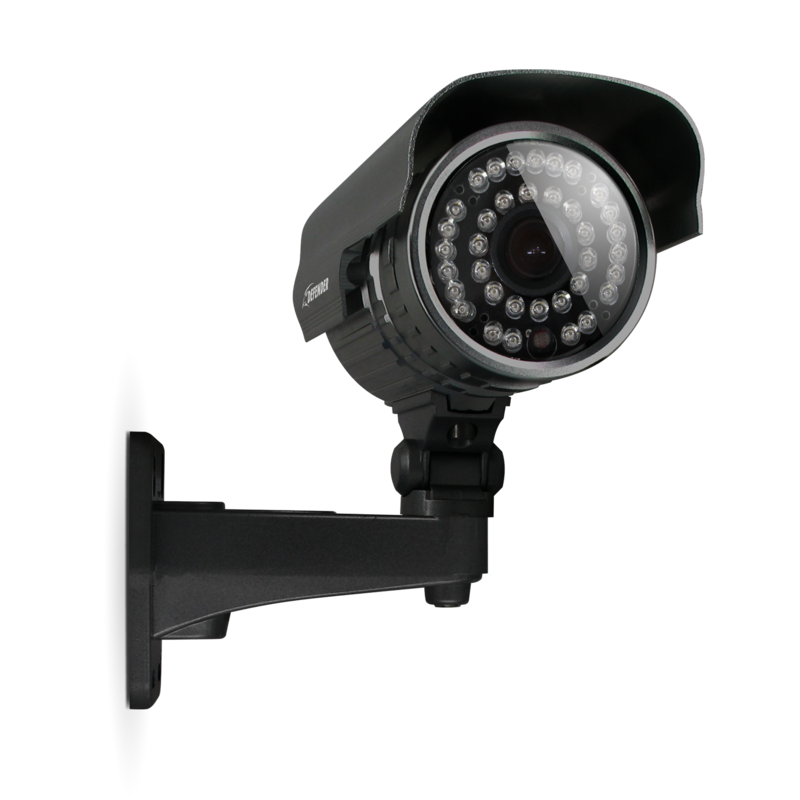 Our Ultra High Resolution all-weather cameras deliver clear, high-quality video with 600TVL and IR cut filter. 36IR LEDs allow for 100ft of automatic night vision. Anti-vandal mount ensures cameras cannot be tampered with and 65ft of cable allows for greater flexibility in mounting around your home or business. Don’t give thieves a chance. Stop them with Defender! Your security system is only worthwhile if you can actually see the person stealing from you. Defender cameras are equipped with 600 TV lines of resolution. The resulting clear, crisp and accurate video feed will help put the criminal away. The things that go bump in the night are sometimes a thief making off with your big-screen TV. Defender cameras are equipped with night vision that automatically activates. Thirty-six infrared ClearVu LEDs provide crisp and detailed night imagery as you monitor from up to 100 feet away, even in complete darkness. So thieves may think they’re lurking in the dark but you can rest assured Defender will see them. Thieves know dismantling a security system is a good way to get off scot free. But they’ll be disappointed with Defender. Each camera’s cable runs through the cable mount and then directly into the wall, leaving no part of the cable exposed. Your footage will be secure. Our customer support team can be reached by phone or by email and live web chat. You’ll always have access to an expert. Support is available in English, Spanish and French. Outdoor security camera, power adapter, 65ft cable, mounting hardware, quick start guide, window warning stickers, 1 year manufacturer's direct warranty. This DVR is a great Product. Easy to connect. I really like the HDMI connection. It looks real sharp on my TV. The extended recording time versus my old one is a plus. I called Defender for help setting up the netviewer on my home computer and Mihel did a great job of helping me install a new program to get it done. go to the web site like the phone service prompts you to, and they really do get back to you quickly. I waited on the phone until I was just to frustrated and hung up, went to the defender site, left my info and a time to call, and Michel was calling me at the time I chose. within 20 mins I was up and running again. thanks again Michel. Cameras seem very good and operational in -27 C weather and easy to set up. Easy to set up !!! I did my research on different unit in the industry and I love the support of this company any questions and set up support was there for me ! I'm just a regular home owner with a drill and screw driver. this is a follow-up of a communication i had with Defender client support, after they kindly replaced a defective camera. i must say that i received excellent support from Defender / CWD Customer support. They stand behind their products and they were responsive to my problem. I will definitely consider doing future business with them. I purchased this unit about 3 weeks ago and the function and picture/record quality is very good. I have a macbook and I had to update my OS to use the playback software. Best buy for the money a 1TB HD is included, can't beat this deal. Very happy with product features/functions. I have two of the systems now and one of the hard drives failed on one my DVR's. I contacted customer support and received a replacement DVR under warranty. Received the DVR quickly and was up and running again after just hooking up existing cables. Very please with customer support and functions of this DVR system. Would recommend this DVR PRO system with 8 cameras. I checked out other products this seems to be the best deal. I didn't give it 5 stars because this is a replacement DVR I had to buy. My first one stopped working after 1year 8months. Overall still pretty happy with it. I have now 3 of these dvrs.2 are 500gb and the other is 1tb.I am pleased with all 3 units. I added cameras to my system with on problem,very easy to configure. Advertising & specifications indicates a wireless range of 1000ft or 750ft or 400ft or 150ft. Seems more like 100ft wireless range. Installed 2 cameras one works off and on the other not at all. The cameras are located within 5 foot of each other looking different directions. The wired system works great, seems like Defender needs to get its act together on wireless. I have already had to tell a friend not to buy the Defender Wireless system. Well I bought the wireless system, however I wish I purchased the wired type of security system. I still had to run electric power to the camera's so I just would have been better off running camera cable. I have four camera's, backyard, 2 on the side and one in front of my home. They are clear and the night vision is good also. My problem is, all my camera's are within 45 ft. of my receiver's and two work as they should but one has a more than normal delay and the last one has a lot more delay and go off quite often from not getting the signal to the receiver. The two that have the delay are just across the garage, at each corner, from the receiver's. If I had purchased the wired system I don't think I would be having this problem. Example of the delay. My wife entering in our home from outside the garage and she is all the way in our home and she still showing on the camera outside. I'm not happy but I'm stuck with it. I had a wired system in a business and it was perfect. This one? Like I said, not happy. The neighbor is wanting to see it, but I'm embarrassed to show it with the camera delays. I was given these cameras as a Christmas gift. Good viewing. Range not so good. Had to run wire to connect to a source of eleu, closer to the camera. Further away the wiring from the camera, no signal at all. Also, one camera just refused to work at all. No signal from the camera at all. Overall, I like the cameras and would recommend.